I'm collaborating with Emily from Livin' Vintage to collect some information on how you shop on etsy. 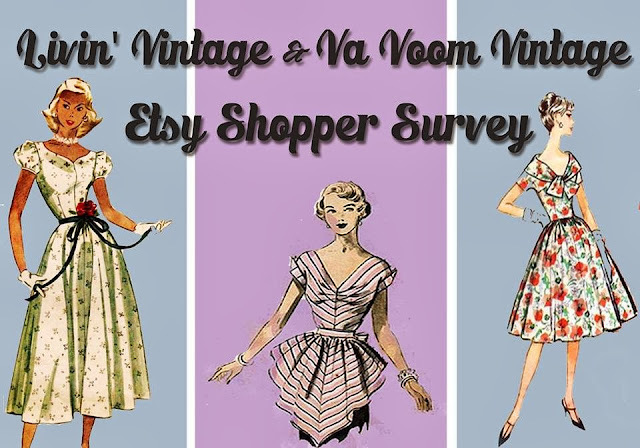 The results of this survey will help Emily provide some great informational articles for vintage etsy sellers and provide a better shopping experience for all! Emily is also offering a $25 gift certificate for her beautiful etsy shop for one lucky participant. Please leave a comment with the link to your completion page so we can track giveaway entrants. One survey per person, please! The Vitage Etsy Shopper Survey is 15 multiple choice questions. The survey will close on November 18th and results will be posted on November 19th with the giveaway winner. I'm not sure this is the link I should provide, but I did take the survey. Thank you!! Lovely survey, ladies, I really liked that you allowed us to add our own comments for many of the questions. Hi Brittany! I completed the survey, what a great idea. Thanks for letting us weigh in! I did the survey too! This is a great idea; thanks for asking our input! Well now, that just made me want to head on over to etsy and shop!